First paragraph. These fields specify what HTML markup should surround the first paragraph of text when the text of this note is exported to HTML. They default to <p> and </p>. Stored in $HTMLFirstParagraphStart and $HTMLFirstParagraphEnd attributes. Subsequent paragraphs. Defaults are as above, but for all other paragraphs of text in the text of the note. Stored in $HTMLParagraphStart and $HTMLParagraphEnd attributes. Indented. 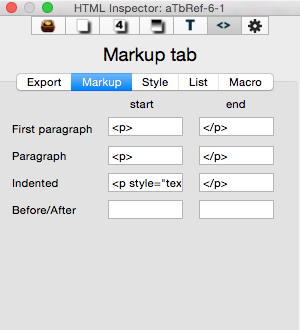 As above but for all paragraphs beginning with a tab character; such paragraphs will use <blockquote>. Stored in $HTMLIndentedParagraphStart and $HTMLIndentedParagraphEnd. Before and after note. Empty by default, this is what is exported immediately before a note's opening paragraph mark-up and after a note's final paragraph market, respectively. In effect, mark-up to enclose ^text^. Can be useful in connection with CSS stylesheets, such as setting before and after to <div> and <div>. Stored in $HTMLExportBefore and $HTMLExportAfter attributes.